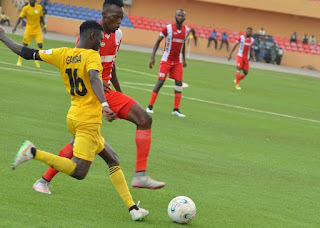 Stephen Odey returned to scoring form as he was on target for MFM FC but it was not enough as Kano Pillars won 3-1 at the Sani Abacha Stadium in matchday 25 of the Nigeria Professional Football League on Sunday, Completesportsnigeria.com reports. The goal was Odey's 15th in the NPFL this season for MFM FC. Kano Pillars went 1-0 up through Rabiu Ali who converted a 12th minute penalty. In the 63rd minute, MFM were back on level terms thanks to Odey who finished off a swift counter. But Pillars eventually went on to win the game as Amos Gyang and Adamu Mohammed scored in the 86th and 92nd minutes respectively to secure the win for Pillars. The defeat means MFM are now third on 40 points in the league table. In Umuahia, a brace from Shedrack Asiegbu secured a 2-1 win for Abia Warriors against leaders Plateau United. Abia Warriors took the lead in the 11th minute following Asiegbu's brilliant volley. With 10 minutes remaining, Plateau United looked to have earned a valuable point away from home following an equaliser from Hamzat Owolabi. Asiegbu completed his brace when je converted a 98th minute penalty after a foul on Sherif Bashir inside the box. The win was Abia Warriors' first ever win against Plateau in the NPFL (one draw, two losses). Plateau United maintain their leadership on the log, five points away from MFM. In Maiduguri, El Kanemi ended their three-game winless run with a 2-0 win against struggling Remo Stars. A goal in each half from Sunday Anthony in the 28th and 48th minutes gave El Kanemi the win.